Start reading Fantastic Beasts on your Kindle in under a minute. This is not really a review, I do not have the book, I am ordering it now. This is more like a rant. Now if you will all learn to read, on the front of the book it says ORIGINAL SCREENPLAY, which means it is a script!! Also, why would they diverge from how Fantastic Beasts was formatted, they are part of the same story line?!!! Please use common sense when living life. Valid reasons to give a lower review are as follows: book was not to your liking or book came in damaged, do not give a bad review because you are not fully comprehensive on the term Original Screenplay. Also I am pretty sure I will like this book like I have with all others of the HARRY POTTER Universe. 4.0 out of 5 starsI am torn here.... it's a great addition to a series, but weak on it's own. 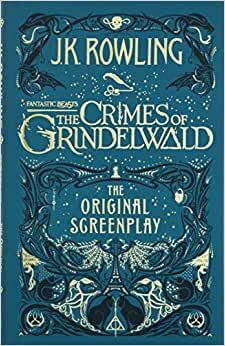 While being moved from America to England, Grindelwald escapes and starts his campaign to gather his supporters and begin his crusade to raise wizards up in the world so that they rule over non-wizards. Lines are drawn and loyalties are tested as Dumbledore and Grindelwald gather their allies. Newt doesn’t want any part in any of that, but when Dumbledore comes to him for aid he answers the call. It seems simple enough…. There are wizards that want to kill Credence, and some (Grindelwald) that want to use him. But, with help, there might be hope for the boy. If there is a way for the boy to live, and not be a danger to anyone, doesn’t he deserve that? In other news, Queenie and Jacob are an item now- with very different ideas about where their relationship is going. Jacob knows what will happen if they marry… he can’t risk Queenie going to jail for him. Queenie wants what everyone else is allowed to have- love, a family. Grindelwald tells her he wants their people to be “free to love”…. is he actually the answer? Sides are being chosen for a fight that will forever change the wizarding world…. which side are you on? I am torn here. I loved this screen play and I really, really liked the movie (I didn’t feel right doing my review until I had seen the movie, nor seeing the movie before reading the screenplay…. I am weird like that). That said, this was more of a plot moving device than something I can see running on it’s own merit. If I didn’t already love the series, and wasn’t already invested, I might not have even cared about this one- but it’s so important. You have your first look at young Dumbledore, already a bit of a legend if only a teacher at Hogwarts. There’s the fan favorites from the last book: Newt, Tina, Jacob, Queenie, Niffler and Pick. We also have some new characters that may be very important later- Nagini (Credence’s friend), Leta Lestrange (Newt’s childhood friend and his brother’s fiance), Nicholas Flamel, and other. Add to that, some great stuff with Newt and the beasts and I am set. That said, I feel like there’s so much more that could have been done here. It was full length for both screenplay and movie…. but felt like nothing really got done. This was necessary to introduce the key players and explain future conflict. If you aren’t already sold on this series, though…. it can be a bit underwhelming. Visually, it’s stunning… but the first movie had better graphics and was all-around more eye catching. I also don’t know how well it’s doing- well, I hope…. but the movie came to theaters 3 days ago and I had the 3D screening to myself (hopefully just because it was a Monday). I loved seeing Niffler again, and the little nifflers. Pick was great and we saw some other beasts, which I felt were well done- the movie really helped me flesh those out it my head. I didn’t like Queenie’s role here. She was all over the place…. understandably, but come on! I wanted her to be stronger, but I fear that she’ll just be a pawn. I feel bad for Jacob- and absolute favorite of mine. I did feel that Depp made a fantastic Grindelwald- he’s supposed to be charismatic, strong, a bit evil but someone that people would gravitate to. Nailed it. Dumbledore’s casting, as well, seemed to be spot on. I really liked his character. Having information from everyone’s pasts also helped flesh things out. Why doesn’t Dumbledore just kick Grindelwald’s all? Find out in this book. Who is Credence? Find out in this book. Despite not feeling like it can stand on it’s own, I am a HUGE fan of this one… but only because I am taking it as an installment of a series instead of just for itself. Three and a half stars… round up to four for the movie. On the adult content scale, there’s violence, but all things considered it wasn’t over the top at all. I give it a three. I pre-ordered this script before the movie was released; I'm glad I did. The day after I saw the movie, I read the script cover-to-cover. It fills in details that you miss in the often-quickly-delivered screen repartee -- the ones that cause mini-arguments with your spouse ("Wait, did he say...?" or "How old would that other character have been at the time...?"). I also picked up on a few details that may or may not be meaningful in subsequent films, such as the relationship between Newt and his assistant. Don't imagine that the script is a stand-in for the movie. It isn't a novelization; it's a script, with instructions to the actors and the director. Not worth the time to review. Clearly Rowling in now only concernrd with the money. Do not buy this garbage. 4.0 out of 5 starsVisually lovely layout, the text is descriptive yet a slower plot than I'd prefer. First, to establish my Potter cred, I offer up preordering books, sitting up in one breathless, speed reading, pages turning so fast smoke started forming reading of The Deathly Hallows, pausing only to react at character deaths. Every book, every movie, the version of Fantastic Beasts that's a wafer thin, yet enticing, paperback along with a similar copy of Quidditch Through The Ages - all reside in loving harmony on my favorites bookshelf with The Tales Of Beedle The Bard. Heroes, humor, sport, coming of age in a truly magical world, family, friendship... The series has all this, and Snape, one of fiction's most debated, loved, and hated characters. Brava, J. K. Rowling, brava. When the first Fantastic Beasts screenplay came out, I hoped for the same excitement and delight, yet found it lacking. I felt the same about the movie - well executed, a visual spectacle, yet weak in plot, dropping breadcrumbs from the original series to keep rabid fans sated. Without spoiling this book (#keepthesecrets), I sadly feel the same after reading the second. The book flap promises it to be the second of a five book/movie series, and I'll still buy the rest because, well, reasons... Yet it seems more drawn out and visual spectacle, plodding the plot along slowly. The fantastic beasts of the title are everywhere, the illustrations and visual layout of the book absolutely lovely. I have no doubt the movie will match the richness of the world and Newt's ever-growing menagerie. The screenplay is written well enough to visualize the scenes quite clearly. It's been seeded with familiar names like *spoiler* and *spoiler* that don't fit the story, just to bring them into it. There's some definite retconning happening to make this fit into the same world, with the same characters that we're familiar with. Some plot elements feel like they're echoing the original series, and multiple romances thread through the book. And yet... As much as I feel it's a three star book, it feels a crime to do that to this author, this series. For the world she's created and keeps building on, for every fully realized new creature, every spell, every fan lifted into reading more by these books... I have to go with four stars, no less. Do you know why I admire you, Newt? More, perhaps, than any man I know? You don't seek power or popularity. You simply ask, is the thing right in itself? If it is, then I must do it, no matter the cost."